Research on servicelearning and community engagement has exploded over the past decade. It is a field now characterized by increasing methodological and theoretical sophistication, vast quantitative and qualitative studies, interdisciplinary research, myriad subjects, and the internationalization of scholarship. 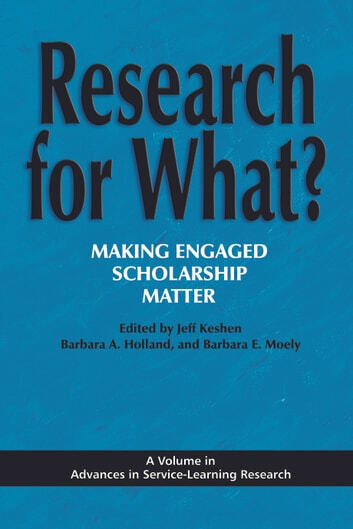 The papers in this volume were selected from nearly 100 presentations made at the 2009 annual conference of the International Association for Research on Service Learning and Community Engagement held in Ottawa, Canada’s national capital. The conference theme, Research for What? emphasized fundamental questions, namely: to what extent is rigorous research uncovering best practices in, and demonstrating the positive results of, servicelearning on teaching, learning and building better communities? The papers examine such themes through lenses that include the application of theory to practice, K12 and universitybased servicelearning, interdisciplinary initiatives, and international servicelearning. 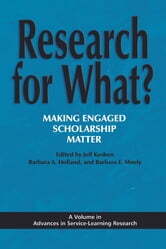 The introduction provides an overview of the very recent, but remarkable, growth of servicelearning in Canada, and the conclusion, written by the recipient of the Association’s annual Distinguished Researcher Award, discusses major developments, and continuing challenges, in servicelearning research. Livres similaires à Research for What?